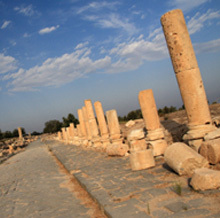 Drive 1.5 hrs in the north to Umm Qais, the ancient Gadara, already mentioned in the Bible in connection with the miracle of the Gadarene swine (Mathew 8:28-34). 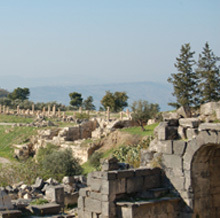 Um Quais was located close to trade route Palestine-Syria, and became a member of the Decapolis under Roman rule. As cultural centre with a cosmopolitan atmosphere it was home to several classic poets and philosophers. 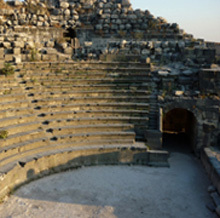 Today you see Greco-Roman remains like the black basalt theatre, colonnaded street, a basilica and a Nymphaeum. Highlight is the panorama view over the Northern Jordan Valley, the Sea of Galilee, and the Golan Heights. ● Transport by air-conditioned vehicle with English speaking, assisting driver. ● Entrance fee Umm Quais. Your credit card details are needed to guarantee your booking. We will not charge your card unless you received the tour confirmation letter and authorize us to do so.